“Crash-a-rumble, smash-a-grumble, what’s at work? Here’s a clue: it will clear the ground for you…” Explore the world of construction transportation through rhythm and rhyme as children use visual and auditory clues to guess which vehicle will make an appearance next. There are bulldozers, diggers, dump trucks, rollers, concrete mixers and builders. But what are they building? Here’s a clue: a place to learn and play, just for you! 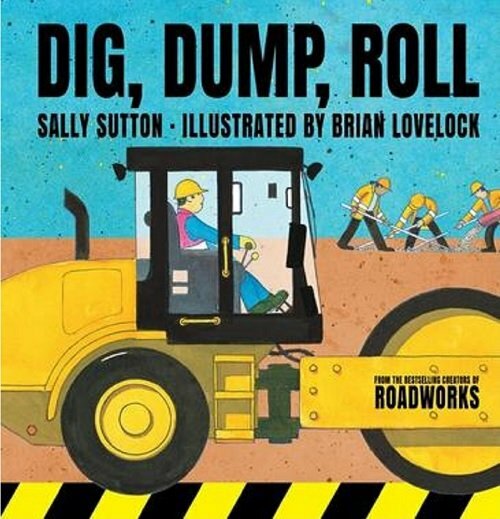 Dig, Dump, Roll is a fantastic transportation and work vehicle themed picture book. This highly engaging book features brightly coloured illustrations, large font and onomatopoeia to describe the different machinery noises. Unlike many other construction-themed books, the pictures show both male and female builders at work! There is a special guide of all the construction vehicles on the last page with their parts clearly labelled. Dig, Dump, Roll is an excellent book for children working on labelling, identify parts of objects and describing functions of objects. For further speech and language targets in ‘Dig, Dump, Roll’, see the list below.